The Wiregrass Ranch Foundation is honored to have been selected as a finalist for the Tampa Bay Business Journal's 2016 Nonprofit of the Year Awards. These awards recognize nonprofit organizations in the Bay area that work for a range of social, civic and healthy causes. There are so many wonderful organizations in the Tampa Bay area doing great work. Congratulations to all the finalists! Thank you to all who joined us for the 4th Annual Wiregrass Ranch Foundation Classic Clay Shoot! Despite the weather, we had a great time raising money for our community. We are currently accepting applications for the Wiregrass Ranch Foundation Scholarship, which will be presented to graduating seniors from four local high schools. Representatives from the Foundation will personally present the scholarship awards to the students at each schools' Senior Awards presentation. Good luck to all applicants! The Wiregrass Ranch Foundation was proud to be a sponsor of the 3rd Annual John Anderson Benefit Concert at the Dan Cannon Auditorium in Dade City last week. The concert was presented by the Dade City Kiwanis Foundation, and all proceeds will be directed to Bayfront Health Dade City Scholarship Fund, Dade City Kiwanis Foundation, Florida Hospital Zephyrhills Heart Institute, Sunrise of Pasco County, The Thomas Promise Foundation, the Boys and Girls Club of Lacoochee and Restored Hope. The Wiregrass Ranch Foundation was happy to support our WCAA All-Star Softball teams on their journey to the state championships! 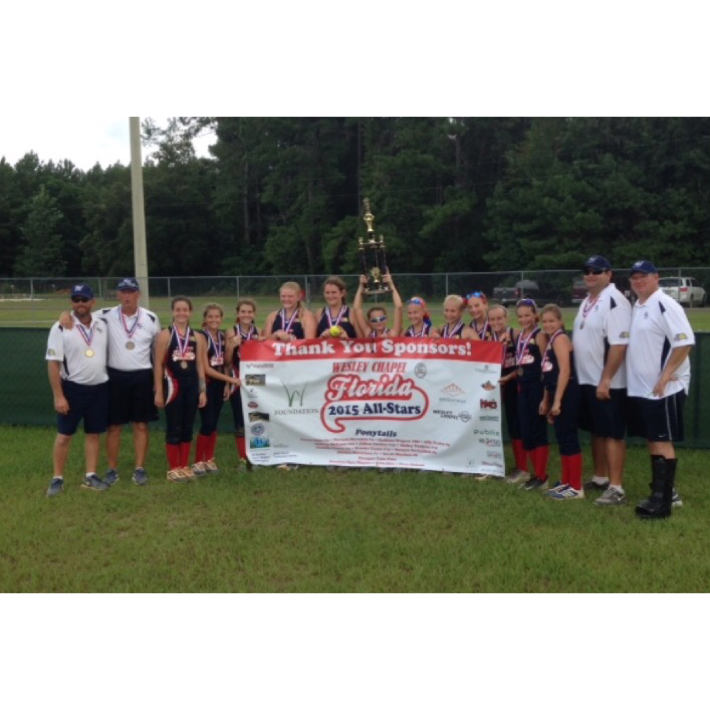 The Ponies (ages 11-12) and the Angels (ages 9-10) were crowned State Champions on July 6 in Bristol, FL. The Foundation is proud to have been a team sponsor of their trip. The two teams will travel to the World Series in North Carolina in early August to compete in the tournament. We are excited to be a part of these young athletes' success and wish them the best at the World Series! Clay Shoot Fun and Scholarships! The Third Annual Wiregrass Ranch Classic Clay Shoot was a success! We had a wonderful time breaking clays and raising money for our community. Participants enjoyed an afternoon of competition followed by an evening of food, music, and raffles at Tampa Bay Sporting Clays. Thanks to all of our wonderful sponsors, participants, and donors, the Wiregrass Ranch Foundation is presenting 15 deserving seniors at three different local high schools with plaques and scholarships. We are honored to be able to support these rising leaders as they pursue their college dreams. We look forward to seeing you at our next event! The Wiregrass Ranch Foundation is gearing up for its 3rd Annual Wiregrass Ranch Classic Clay Shoot. The shoot will be held February 7, 2015 at Tampa Bay Sporting Clays. Lennar Homes has once again shown enormous support for the Foundation and has signed on as the Title Sponsor. Last year's event was an exciting and competitive event that raised significant funds for our community. The Foundation donated $20,000 to the Boys and Girls Club of Lacoochee in order to help complete their new facility, as well as partnered with OnBikes again for the second year in a row to provide 500 new bikes to foster children in the Tampa Bay area. We are so excited to host the 3rd Annual Wiregrass Ranch Classic Clay Shoot this year! If you are interested in sponsoring this event, donating items to be raffled, or signing up as a shooter, please click here. We hope to see you there! December 2014: The Wiregrass Ranch Foundation partnered with OnBikes for the second year in a row to deliver 500 bikes to foster children in the Tampa Bay Area. The delivery took place at The Shops of Wiregrass before Christmas and was a joyful celebration.